11:40 pm - Arisia executive board, you have some EXPLAINING to do. I am going to want my money back if someone on staff, who is NOT living up to the code of contact, is allowed to remain there. I am not going to let my teenager attend a conference where a predator might be able to get away with pushy, stalkery crap. The Arisia Code of Conduct does indeed state: "Additionally, all Staff are representatives of Arisia and therefore are held to a higher standard of behavior, even when off duty." This is not holding representatives of Arisia to a higher standard. This is allowing extremely "bad behavior" to go unremarked and hidden from the attendees and guests. NOT OKAY, EXECUTIVE BOARD. NOT OKAY. 08:54 am - Is this thing still on? Just checking to see if this thing still works and it would be possible here for people to post about roommates etc. We have a double at The Aloft (1/2 block from The Westin & less expensive), and are near the top of the waitlist for The Westin so may may have a last minute option to switch. We are two adults who have attended may arisias looking for one or two additional adults. We have both bed space & floor space available. The occupancy wlll be limited to 4 so there will be no long wait for the bathroom in the AM and no violation of arisia & hotel rules. If you are interested please email me at math mw hyphen lj at yahoo (remonve the spaces and fix the punctuation). Time is short and I do not check livejournal that frequently; you you will get a much faster response by emailing me. 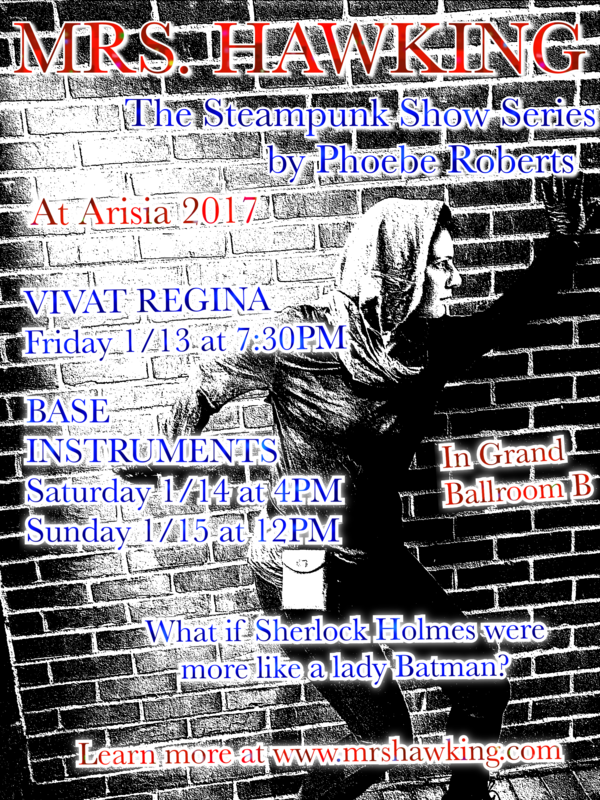 The Chameleon's Dish Theatre is really excited to return to Arisia in 2017, and invite you to the next two shows in the Mrs. Hawking series! Last year in 2016 we brought you "Mrs. Hawking," and you can watch the video of that performance here. We also debuted our second show, Vivat Regina. This year in 2017, you can see Vivat Regina along with the debut of our third show, Base Instruments! No knowledge of previous shows is required to enjoy any of of these performances! 11:31 am - Kings & Suites still available! EDIT 1/5/16: There are currently no more rooms available at the Westin. If you filled out the request form, you will be contacted if a room meeting your request comes available. Arisia is only a week away and we still have King Rooms and some Suites available at the Westin. Please fill out the Special Request Form (http://arisia.org/HotelSpecialRequests) if you would like a room. There are no doubles available. 06:04 pm - Arisia 2017 Programming Is LIVE! The programming and events schedule for Arisia 2017 is up on KonOpas, one of our mobile options. Head to http://www.arisia.org/publications for instructions on how to use it (no download necessary!) and start planning your Arisia weekend. Our schedule is subject to change between now and the convention, but we'll make sure to keep the online/mobile versions updated, even throughout the con. Greetings and felicitations. My friend Leonard Houle and I have a reservation for the Westin Boston Waterfront Hotel for Friday 13 January through Monday 16 January 2017 (three nights) for Arisia 2017 in a quiet room. We have floor space available, and are looking for people to share the cost. We are two mature males who will be up late, but are otherwise quiet. Please contact me at jwatson8 [at] comcast [dot] net if you are interested. The Ig Nobels are once again coming to Arisia, and you can nominate presenters. Arisia Blood Drive beneficiary Mass General Hospital (MGH) is now offering pre-signups for blood donations to be taken at Arisia '17. At this ConCom, in addition to hearing updates from our Division Heads and available job listings, we'll be going over the results of the Registration LARP we conducted at the previous meeting and then walking everyone through the meetings, deadlines, and expectations between now and Day 1 of Arisia 2017!